Many fantasy readers cut their teeth on Raymond Feist’s early works. The Riftwar Saga is considered a classic, and The Serpentwar Saga is another favorite. Over time, some readers drifted away as the neverending story of Midkemia played out over seven sagas, a few stand-alone titles, and even a video game tie-in novel. Five years after putting a wrap on the Midkemia stories, Raymond Feist is back with a new series set in a brand new universe. King of Ashes opens with a story of a betrayal. A longstanding alliance between the five Kingdoms of North and South Tembria is broken as the other nations conspire, some reluctantly, to destroy Ithrace, the Kingdom of Flames. King Steveren Langene, known as Firemane, is executed and his entire family slaughtered, or so it is believed. One man, Baron Daylon Dumarch, seeks the aid of the so-called Kingdom of the Night to hide the survival of a single Langene infant. The plot primarily follows two main characters: Hatu, a young man who has been trained his entire life to be a spy and assassin for the Kingdom of the Night, and Declan, a talented blacksmith who has just attained master status. As one might guess, both have red hair and both are connected to Baron Dumarch. Hatu’s story line follows his exploits as he serves the Nocusara, the “hidden warriors” of the Kingdom of the Night. The reader meets as well his friends Donte and Hava, also training up with the Nocusara. Hatu’s exploits take us to several places within the North Tembria, and we gain hints of major plots on the verge of unfolding. He also encounters several deadly adversaries, and by the end of the novel, he has learned his true lineage, and finds himself pursued by at least two different groups: one bent on killing him, the other supposedly wanting to help him. Meanwhile, another threat, one from much closer, looms large. Declan’s story begins with his rise to master status, a point at which he is entrusted with the secret to forging King’s Steel, a talent that is likely to pay dividends in later books. We follow him from his home and on to the western realm, and we follow his story as he falls in love and seeks to establish his business as a blacksmith at the edge of the frontier. As with Hatu’s plotline, Declan does not know his true parentage. By the end of the story, the reader has been given that information, but is it reliable? 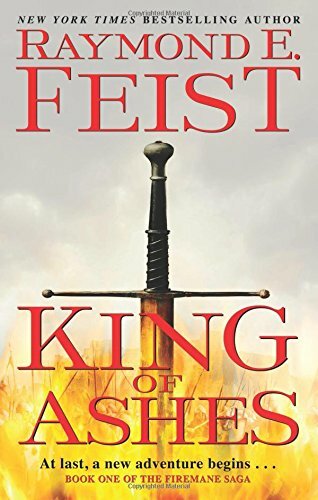 In some ways, King of Ashes reads much like Feist’s early works. His voice is strong, and certain characters and scenes echo previous novels. It does, however, reflect the sensibilities of contemporary readers. It’s hardly grimdark, but violence, language, and sexuality are dealt with in a much more frank manner than in the novels penned in the 1980s. On the downside, the pacing is uneven. Some scenes feel rushed, while others are overlong, with lots of telling and navel-gazing. Other elements are repetitive. A reader could almost make a drinking game out of one particular chapter, in which we’re told again and again that despite Declan’s feelings for his love interest, he just couldn’t bring himself to make a move. There’s also a lot of setup in this book, but no big payoff at the end. Feist sets up the pieces on the board, but the game really hasn’t begun yet. Despite a few weaknesses, King of Ashes is a solid read. While none of the characters hook the reader in the way Jimmy the Hand or Arutha did, they are likable and interesting. The last hundred pages fly by and leave the reader eager to see where the story goes next. King of Ashes is the entertaining beginning to a welcome new series by a fantasy great.